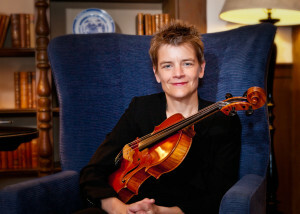 Susan Pardue is a member of the Jacksonville Symphony Orchestra in Jacksonville, Florida. Prior to moving to Jacksonville, she played with the New World Symphony in Miami. A native of North Carolina, she earned a high school diploma and bachelor of music degree from the North Carolina School of the Arts and a master of music degree from the Juilliard School. Her viola teachers have included Sally Peck in North Carolina, William Lincer at Juilliard and Piero Farulli, with whom she studied in Italy on a Fulbright scholarship. 1) Where were you first introduced to chamber music? I’m not sure when the very first time was, but one thing I saw as a young child that made a huge impression on me was a video of Itzhak Perlman, Pinchas Zukerman, Jacqueline du Pre, Zubin Mehta and Daniel Barenboim playing Schubert’s “Trout” Quintet. Their love for the music and joy in their friendship was so much fun to see. It seemed the perfect combination to me and I wanted to have that kind of fun. 2) Why do you love it? I mainly love it because it is music among friends, for friends. 3) Why should people come out to a concert? There are many reasons. One is that chamber music is more intimate and personal than a bigger concert. Because of this, there is more of an opportunity to see and know the musicians and audience up close. We also play some great music. 4) What is special about this season? Well, we have two concerts left. Our March 6 concert features quartets by Haydn and Brahms, kind of “meat and potatoes” pieces. The April 10 concert features a Beethoven quartet and the Mendelssohn Octet, both pieces written when the composers were young men. The Octet is one of the most exciting chamber music pieces I have ever heard. It will be the first time that we have played a piece written for eight musicians. All of the music is special, and all of it is being performed for the first time by FCMP. 5) How has FCMP evolved over the years? We hopefully get better each concert. We are finding more and more pieces that interest us, so the concerts should continue to be exciting. We are looking forward to our fourth season, and we hope to announce that soon. Sign up for our email newsletter to get updates on upcoming programs, special pricing and the latest Florida Chamber Music Project news. A COPY OF THE OFFICIAL REGISTRATION AND FINANCIAL INFORMATION FOR THE FLORIDA CHAMBER MUSIC PROJECT (CH39459) MAY BE OBTAINED FROM THE DIVISION OF CONSUMER SERVICES BY CALLING TOLL-FREE 800-HELP-FLA (800-435-7352) WITHIN THE STATE OR ONLINE AT WWW.800HELPFLA.COM. REGISTRATION DOES NOT IMPLY ENDORSEMENT, APPROVAL, OR RECOMMENDATION BY THE STATE.